The Campfire An Aussie Built Camper For Under $20,000! 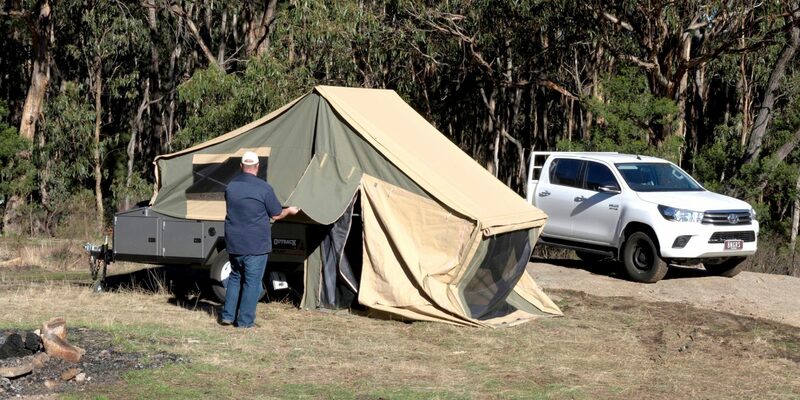 Could this be the most affordable Australian made off-road camper, and is it worth the bucks? 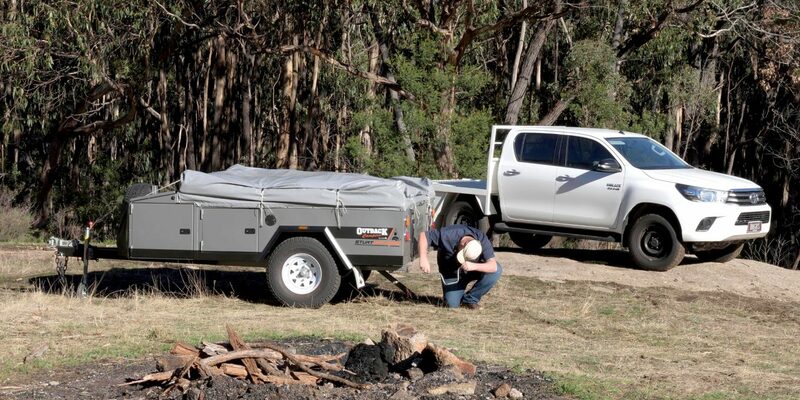 In modern day Australia where imported campers are becoming the norm rather than the exception, it’s great to see an Aussie company battling to stay in business with a product that’s proudly ‘Strayan! Jim Coulson (Outback Campers MD) started working in the canvas industry back in 1968. Jim then decided to go into the camper business with the idea of building everything in-house, and so Outback Campers was born. Outback Campers still manufactures the complete camper with a steel workshop, canvas workshop and assembly workshop to do so. Outback is also able to upgrade, repair and alter existing campers with optional extras, which is a big bonus for their customers. 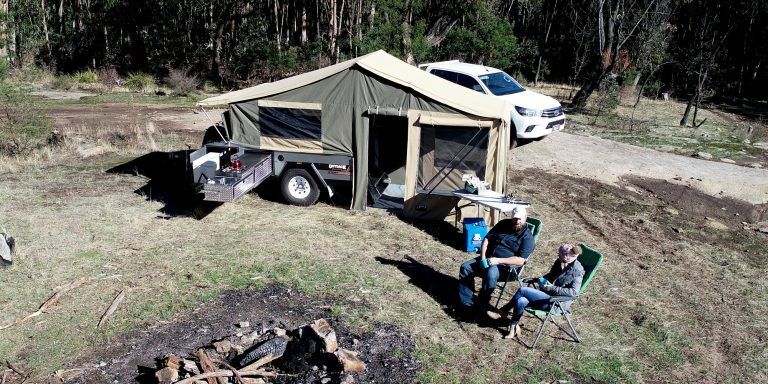 The Coulsons are forging ahead and are now manufacturing slide-on campers, ute canopies, caravan annexes, tents and swags, as well as custom canvas work. They mean to survive in the new world order of imported gear! With that said, let’s take a closer look at the Sturt off-road camper and see why it’s not going to burn a hole in the bank balance, at least not upfront. It might be a different story though when you spend up big in the various towns, pubs and amazing destinations you’ll visit while touring. Outback manufacture the body of the Sturt in-house from 1.6mm etch primed BlueScope steel with a 100 x 50 x 3mm steel RHS drawbar. Enclosed wheel guards offer a sleeker looking package plus there’s plenty of secure internal storage. The recessed kitchen, fridge and tailgate doors come complete with locks and automotive dust seals. A large lockable toolbox with a stone guard features on the front and I liked the mesh floor above the fridge slide to prevent stored stuff falling down around the fridge. The A-frame sports an OzHitch off-road swivel coupling that is great for off-road work and easy to hook up. There are twin 4.5kg gas bottles in external holders, easily accessed on the A-frame as well as the spare wheel. This is all protected by a full-width stone guard. Mechanically speaking, this off-road camper features AL-KO independent rubber torsion bar suspension, 10-inch off-road electric brakes, 15-inch on-road wheels and tyres, and is very neat underneath. A slide-out stainless steel kitchen with a two-burner Smev stove and plumbed sink also features plenty of storage and a great food prep space. I liked the fold-up draining rack too; it’s a clever idea. 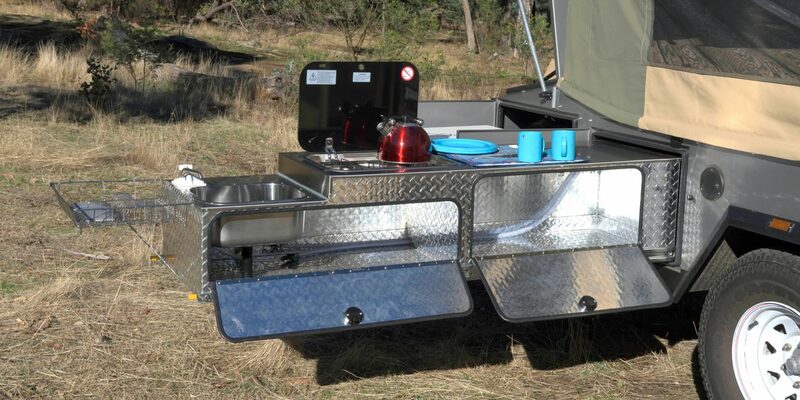 Next to this, towards the front of the camper, is a toolbox fridge slide, which is large enough to cater for a 110L Evakool fridge so it will handle a lot of others on the market as well. Other features include a 12V battery system with a 125 Amp AGM battery mounted in the front toolbox, a 100L water tank with lockable filler, gas strut assisted fold-down tailgate staircase, LED tail lights, a swing-up AL-KO jockey wheel and wind-down stabilising legs. This trailer is solidly built; everything is easy to reach and practical. Mechanically, it has all the basics and the basics are quality product rather than cheap and nasty. It’s certainly a solid base for touring. The Sturt camper takes around 10 minutes to erect fully in ambling mode. Ben Coulson, who helped us on the shoot, can do it faster and so do his customers once they have the practice … it is easy to erect. The job starts with removing the waterproof travel cover. The rear folding tent with the outback gas strut framing system is then pulled out and flops down over the back of the camper. Next, some pegs lock down the tent sections of the 10oz wax converters Dynaproofed Billabong canvas. The final erection is done with the use of internal adjustable poles. An external blind over bed-end window can then be set up and that’s the basics done. All the awnings and other options can then be attached as required, or if not being used they can be folded up under the travel cover as there’s ample room to pack them away still fitted. There is an amazing amount of access, light and airflow that floods the tent from the windows and large doors. Once inside, the draft skirt gets clipped into position and essentially it’s ready to go. The interior of the camper box section is fully carpeted. The interior is practical with steps leading up to the bed area where a heavy duty foam mattress is located. On either side of the steps are small storage slide-out drawers. Under the bed there is plenty of room for boxes for food and clothes storage. As I said, it’s a basic bedroom but one that works really well. Outback Campers has put a lot of thought into the overall package they have developed. 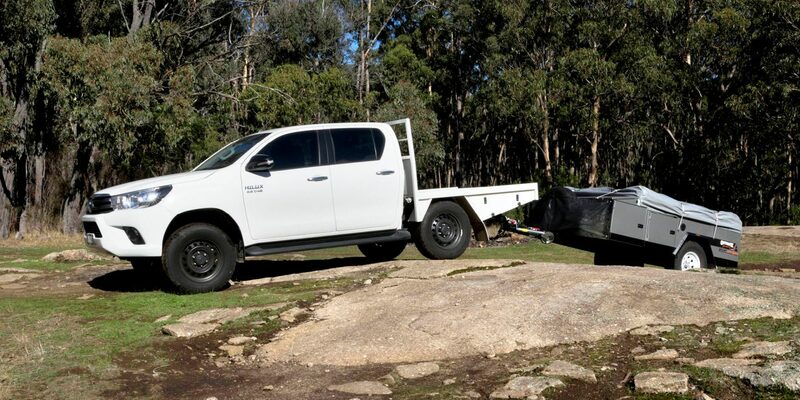 Starting with a basic package that is more than capable and affordable, they then offer a huge raft of options for the Sturt that will make it even more loveable and practical for the owners. For practical reasons, options include shade cloth matting for the soft floor and annexe plus annexe walls with draught skirts as well as flywire walls and draught skirts. Removable clear PVC windows are great for inclement weather too. There is a plain side wall and for kids or extra storage, a rear bedroom is available. A four-inch inner-spring mattress can also be optioned into the package. Other practical options include rear quarter panel storage compartments and for outdoor activities there is a standard style boat rack or a swing-over boat rack plus an outboard motor rack, and for the keen cyclists, a bike rack and even another spare wheel rack can be fitted. There are electrical upgrades and lighting options, too. Outback are working on giving owners plenty of ways to match a camper to their budget. It’s exciting to see an affordable Aussie made product that ticks a lot of boxes for camping couples or families. This camper being all-Aussie made means that it’s built rugged enough for our conditions and even the AL-KO torsion bar suspension is a proven product. Although it lacks a bit of wheel travel compared to some other off-road campers, it’s no slouch. The fact that this unit can be upgraded extensively pre and post-sale means it will attract plenty of buyers who can build it up according to their individual budget and preferences. Just this point alone is excellent. Overall, this camper is well worth considering as an off-roader which, while basic in some respects, is more than capable as a tourer! We have a 2006 outback Sturt it has been all over this country, my kids learnt to put it up in under 4 minutes when they were teenagers. (Without the awning) Outback have been great over the years, I think we had one of the first modified trailers with a door and slide in the front box for our fridge. Thanks for helping us create so many wonderful memories.